Dulevo 200 quattro is a unique machine in its field, the combination of the best features of various collection systems results in optimum sweeping performance. 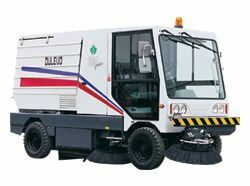 Dulevo 200 Quattro industrial and street sweeper is one of the world's first mid-sized street sweepers to offer a unique combination of compact mechanical and suction technologies. The Dulevo 200 Quattro is compact, quite comfortable, attractive and easy to drive. It sets new standards of driver comfort with the latest in sound suppression inside the cabin. The Dulevo 200 Quattro is designed to sweep roads as well as factories. It can be used indoors and outdoors wet or dry. Its can be used indifferently in remote cold climates or super hot outback climates. Compact size and tight turning circle make the Dulevo 200 Quattro the ideal machine in any situation where space is limited.